He does great work and this summer he completed several projects just for me! I’ve been meaning to post this for awhile and just couldn’t get the pictures and everything together. Once Dale felt well he couldn’t sit still and I couldn’t have him in the house all summer long so he spent a lot of time out in the shop. 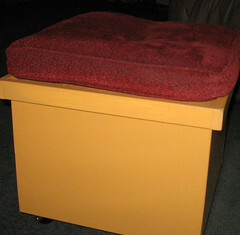 The first thing he made me was a footstool on castors with a removable lid for storage. I’m sitting with my feet propped up on it as I type this post. It’s comfy and movable and I love it. 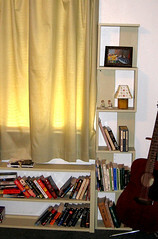 We read a lot of paperbacks so he built some bookshelves to put under the window in our bedroom and then I found a picture of some interesting shelves and he decided he wanted to make them as well, so now they are on either side of that same window. In between the large projects he made some little things for my desk – a pencil holder, a box to hold my card files and an easel to use with my working cards. Notice the joints on the boxes. Isn’t he talented?? The best and most complicated I saved til last. 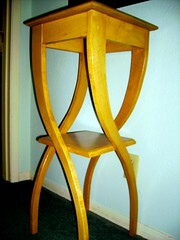 We just call it the crooked legged table but it is such a pretty and unusual design. I showed my handy husband a picture of a similar table in a magazine some years ago and he said he could make it. I argued and of course he had to prove me wrong! There are no nails or screws – only pegs. I think it and he are amazing! There were other projects including new doors on the end of the shop and various repairs around the house. He also made a garden. Now that school has started he will start cooking again and I am looking forward to that creativity that made sawdust all summer filling the table and my tummy as the weather turns cold. For now I have a few more projects for him while the weather is still warm. I think I will keep him. This entry was posted in health, Personal on September 8, 2007 by Dee. Oh – that last table is really neat. Dale did a great job!